“The markets are OK with higher interest rates.” It’s become the mantra of the financial media. And we believe it (but not really) because we want to. We need to. If for no other reason than the sake of our portfolios and 401(k)s.
But anyone who’s paid close attention to market activity this year knows this statement to be false. The markets are not OK with higher rates. We’ve had two pseudo corrections so far this year, and the S&P 500 Index is down more than 5% from its January highs. Many stocks are still trading at lofty valuations based on the Federal Reserve’s easy-money policies of the past decade. Current growth in stocks is being maintained by the last vestiges of these policies through buybacks. The new tax plan is helping extend this effect by allowing companies like Apple to bring home boatloads of cash to increase buyback plans. But these artificial supports are starting to give way. What’s more, one particular sector is signaling that the situation is about to get worse: homebuilders. New home sales rose to a four-month high in March, according to the Commerce Department. February’s sales were adjusted higher, and expectations are for more impressive gains in April. What’s more, inventories of new homes are running below historical averages, with only about 5.2 months of available supply on hand. It sounds like the perfect setup for the housing sector, right? At least until you look at the underlying cause. The 30-year fixed mortgage rate hit 4.66% this week, its highest level in roughly seven years. And rates are projected to continue higher throughout 2018, with some analysts projecting 5% heading into 2019. In a way, the surge in home buying is very similar to the current situation with the broader market and stock buybacks. Homebuyers are rushing to take advantage of easy money while they can. When rates get too high, housing prices get too frothy. And as the easy money dries up, so too will demand. Wall Street investors have already taken notice of the situation. Homebuilding stocks were hit hard by the corrections in February and March and never really recovered. 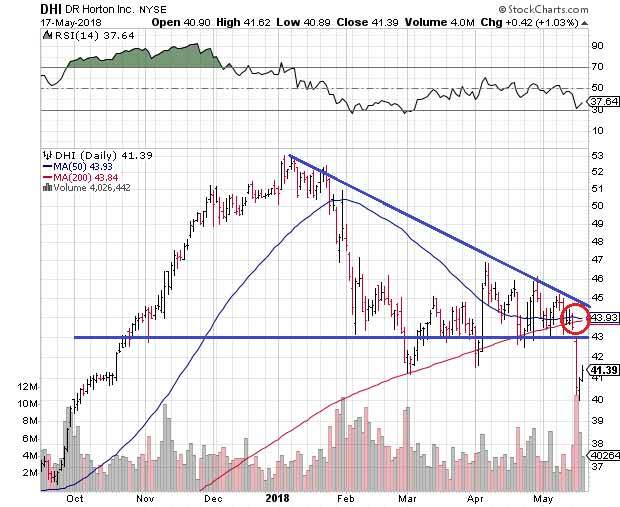 It’s created a dire technical situation for many homebuilding stocks. 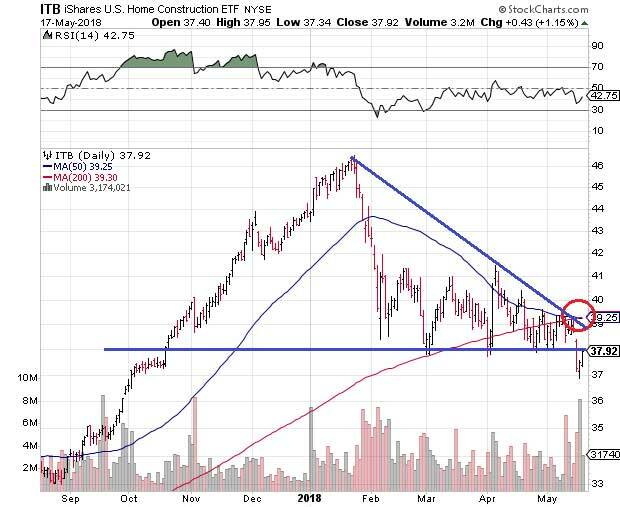 For example, the iShares U.S. Home Construction ETF (ITB) recently lost its fight for key technical support near $38. ITB was squeezed lower by a series of lower highs, and any optimism left for the sector evaporated following the recent mortgage-rate news. 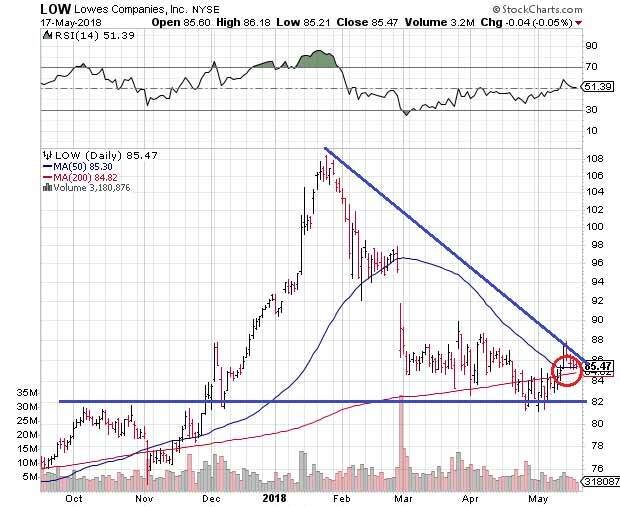 Making matters worse, ITB’s 50- and 200-day moving averages are poised for a “death cross” — a bearish technical signal that is often followed by heavy selling pressure. It may just seem like two lines crossing on a graph, but many technical traders take these signals seriously and adjust their holdings accordingly. Even more disturbing is that we see this exact technical setup across the board in the housing sector. D.R. 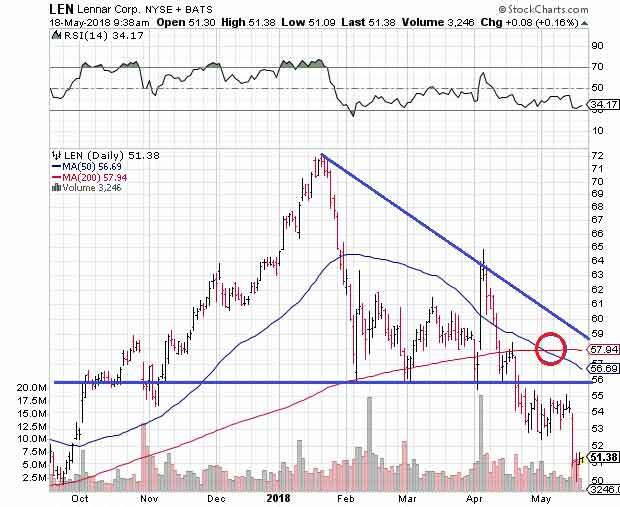 Horton Inc. (NYSE: DHI), Lennar Corp. (NYSE: LEN) and even home improvement retailer Lowe’s Cos. (NYSE: LOW) are signaling that a decline is imminent. The takeaway here isn’t going to be my usually rosy “wait for a pullback and buy.” The housing sector is almost certainly heading sharply lower as easy money evaporates. The question is: Is the drafty housing market sector the canary in the coal mine? You can’t afford to wait for an answer. It’s time to seriously consider your current holdings and look at disaster-proofing your portfolio. Editor’s Note: There’s a “magic” metal with unheard-of superpowers that other metals simply don’t have. Scientists are using it to fight diabetes, depression, low blood pressure and fatigue. And there’s an opportunity today in the company that’s sitting on top of a huge “magic” metal deposit that could give you the chance to turn every $1,000 into $31,130. Of course, there are no guarantees in the financial markets … but if this mining company does only half of what it’s expected to, it will make you incredibly wealthy. To see why the supply crunch this “magic” metal is facing is undeniable, click here now.